We have been freed from sin, and we cannot be transformed by trying to manage sin by human effort. We are called to be saints, not sinners. We live "above the line," setting our thought on things above in the unseen realm, where we have been declared perfect, rather than "below the line," setting our thoughts on things below in the seen realm, where we are in the natural -- "confessing" (i.e., declaring) ourselves to be sinners. Paul's gospel is one of transformation and not one of justification - then looking for something to do so we might keep (maintain) our justification. The church is Christians in unity, serving and following Christ, and not individuals in isolation. This relatively short book touches on the "Who" and "Why" of creation, which are the questions that the Bible addresses. God's love is shown in the creation. Fretting about "how" God did the creation is way down on the list of questions with eternal significance. Relaxing With God: The Neglected Spiritual Discipline. The Naked Gospel: Truth You May Never Hear in Church. Heaven is Now: Awakening Your Five Spiritual Senses to the Wonders of Grace. These (and other) books by Andrew Farley and his radio program (see free app "AFM" at app store) focus on the grace and forgiveness from God and on how we nevertheless continue to try and earn our forgiveness from "the Law" while all the time denying we do that. The authors of these publications -- books, blogs, A/V presentations, etc. -- explain spiritual concepts much more clearly using a less confrontational-sounding approach. Some of these URL's refer to an individual post, but one can go to the home page or index from there. Dad was a great man of faith. He was ready to go home and be with Jesus. I, however, was not ready for him to go. Mom and my brother and sisters were not ready. The grandkids were not ready. We all love him and miss him so very, very much. I'm not really sure where to go from here, but I know that Dad would want us to keep walking forward and do something good with our lives. My personal goal is to try and become the person that my Dad already thought I was. RIP Daddy. See you on the other side. The last sentence, "...become the person that my Dad already thought I was," is profound, because that is a description of God the Father for us. First, it is obvious that all fathers would want to be like this - a model of God the Father for our wife and children. That is what the family from out of a God-ordained marriage covenant is all about (Eph. 5:22-32). But, more, it describes one relationship of one human father that is everything to one family, representing a tiny glimpse of an entire universe of fulfillment of the foreordained plan of God, made before time began and going forward into eternity. When we choose God's plan and remain faithful, we glorify God, we are transformed into His true righteousness and holiness (Rom. 12:1-2; 2 Cor. 3:18; Eph. 4:24; Col. 3:10), and we bear witness to the world of the manifold wisdom of God (Eph. 3:10). God blotted out our sins (Col. 2:3-13-15) so we could be unencumbered to keep eyes on Jesus and run the race before us (Heb. 12:1-2). Our sins from the shortcomings of the human nature, trying in the flesh to be like God, have been removed so that we can grow by the control of the spiritual nature into the fullness of Jesus Christ (Eph. 4:12-16). Like the daughter's tribute to her Dad, by the grace of God in accordance with His foreordained plan, we yield to the power of transformation so that we can become the person in the earthly realms that God has predestined us to be in Christ (Eph.1:4) and be the person that He has declared we already are -- seated with Christ in the heavenly realms (Eph. 2:6). Cycles ‘r us. There are many cycles in nature, without which there couldn’t be any life – water cycle, weather cycles, oxygen/carbon dioxide cycle, nitrogen cycle, etc. These cycles are related to the flow of gases or liquids, changes of state, or transfer of heat. They are types of thermodynamic cycles. There are many anatomical structures in plants and animals that have the design of a circle, sphere, or coil. Rotation of planets and moons in their orbits are cyclic. Seasons are cyclic. Moon phases are cyclic. Many insect and other animal life patterns are cyclic. Hormones go up and down in cyclic fashion. 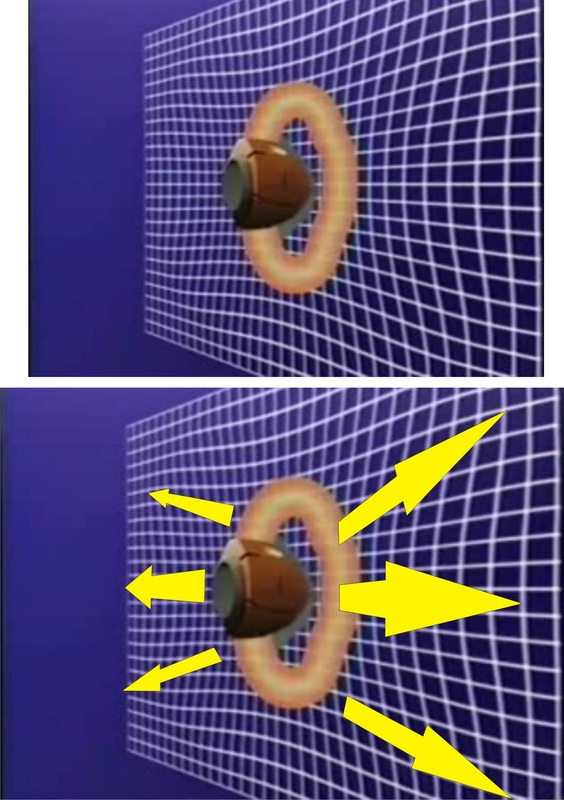 Atomic structure is made up of electrons traveling in space in special areas of probability that are cyclic in shape – sphere, ellipse, dumbbell, etc. The smallest cycle on record comes from string theory. All these cycles operate according to natural law. The same principles operate both in relatively simple cycles as well as more complex ones. That is why the observations of the life cycle of a bacterial colony isolated from an outside source of energy is relevant in principle to larger, more involved cycles. Cycles of smaller frequencies make up cycles of larger frequencies which make up still larger and larger cycles. It difficult to conceive that a cycle of seasons in a year would be composed of millions upon millions of smaller cycles that all add up in a very precise way and in an integrated pattern, all under the same laws of nature. Heat transfer – thermodynamics. We get our outside energy from the sun – heat transfer. There are solar cycles, also. Thermodynamics. 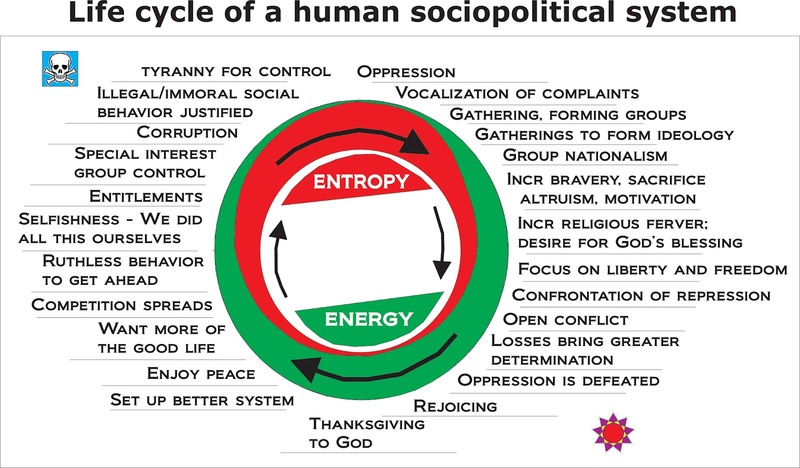 The concept of cycles takes on a metaphysical character in considering economic cycles, business cycles, political cycles, social cycles, cycles of dress style, cycles of moral ethics – all of which are based on human behavior and attitudes – mainly from brain and mind functions of humans. But all these go back to the thermodynamics of neurotransmitter chemistry and how humans think about the environmental cycles they find themselves in. Cycles do not dictate or control human behavior; humans are in control of their behavior by the choices they make based on their reaction and thinking about the physical cycles. Perhaps there should be a book written, The Effect of Thermodynamics on the Sociopolitical Cycle Named “The Rise and Fall of the Roman Empire.” The Rise and Fall of Capitalism. The Rise and Fall of Organized Institutional Religion. But social cycles involve the thermodynamic principle of entropy and energy just the same as prevailed over the bacterial culture. Niall Ferguson has written books on the rise and fall of empires with special emphasis on the West and present America – Civilization (The West and the Rest), Colossus (The Price of America’s Empire), and The War of the World (Twentieth-Century Conflict and the Descent of the West). Social cycles seem long compared to our life time but not in the span of civilization . Some social cycles were mentioned as examples in previous posts – a life cycle, a church cycle, a business cycle, a population cycle, and the cycle of Noah and the Great Flood. 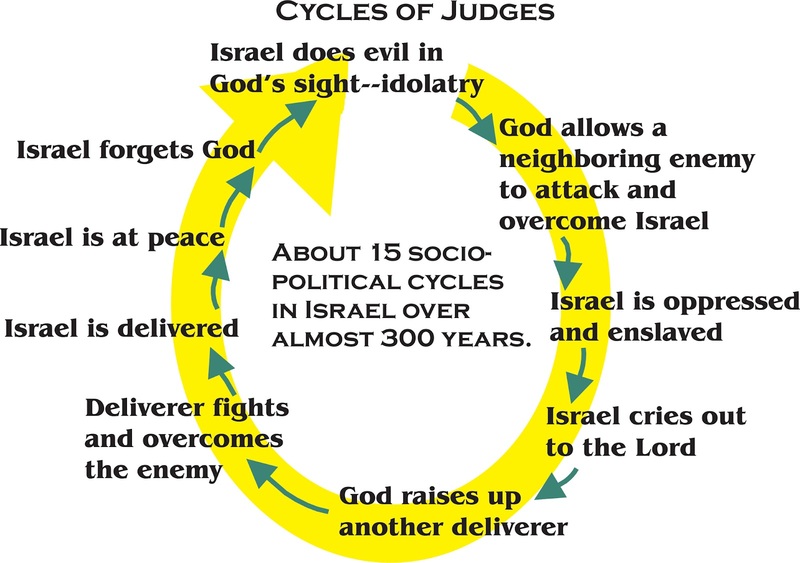 In this post we will consider two more sociopolitical cycles – a historical one from the period of the Judges of Israel described in the Old Testament and a second one under current public circulation. Joshua led the Israelites into an organized and systematic conquest of the Promised Land (Judges 1). The people were faithful to God throughout the lifetime of Joshua and the first generation of elders who outlived him, because they had seen the great things God had done for Israel (Jdg. 2:7). But then another generation grew up that did not know God or what He had done for them, and they began to disobey and to follow idols. Some of the tribes had not completely driven out all of the inhabitants of Canaan as God had commanded, and God said because of this disobedience these people and their false gods would be a constant problem for the Israelites. 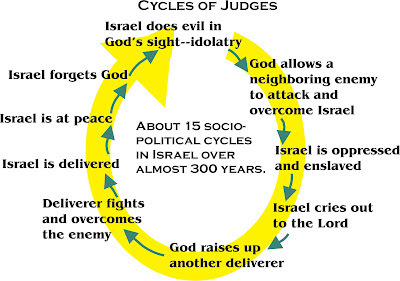 After this declaration, the Israelites went through almost 300 years of sociopolitical cycles with the same repeating pattern – things go well, Israel gets complacent, Israel disobeys and worships idols, God withdraws protection, Israelites get overrun by Canaanites, Israel gets oppressed, Israel recognizes and repents, Israel turns and cries out to God, God hears and raises a judge who fights the oppressors and delivers Israel, Israel enjoys period of peace, judge dies, Israel gets disobedient. Leaders between Joshua and Saul (King) were Othniel (Jdg. 3:9), Ehud (Jdg. 3:15), Shamgar (Jdg. 3:31), Deborah (Jdg. 4:5), Gideon (Jdg. 6:36), Abimelech (Jdg. 9:1), Tola (Jdg. 10.1), Jair (Jdg. 10:3), Jephthah (Jdg. 11:11), Isban (Jdg. 12:8), Elon (Jdg. 12:11)), Abdon (Jdg. 12:13), Samson (Jdg. 16:30), Eli (1 Sam. 4:18), and Samuel (1 Sam. 7:15). Similar cycles persisted throughout the period of kings and captivity. 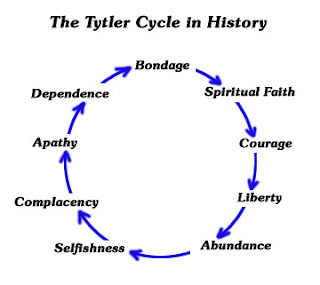 Another example of a sociopolitical cycle with many similarities to a bacterial life cycle is the so-called “Tytler Cycle.” This is the subject of a lot of semi-correct/semi-hoax emails that are used to promote a particular political position under the misname “Tyler Cycle.” Tytler was a real person and he said some real things that are interesting, but the shape of the story has morphed, particularly in the last 12 or so years. Tytler believed that democratic forms of government such as those of Greece and Rome have a natural evolution from initial virtue toward eventual corruption and decline. In Greece, for example, Tytler argues that "the patriotic spirit and love of ingenious freedom ... became gradually corrupted as the nation advanced in power and splendor." Tytler goes on to generalize: "Patriotism always exists in the greatest degree in rude nations, and in an early period of society. Like all other affections and passions, it operates with the greatest force where it meets with the greatest difficulties ... but in a state of ease and safety, as if wanting its appropriate nourishment, it languishes and decays." ... "It is a law of nature to which no experience has ever furnished an exception, that the rising grandeur and opulence of a nation must be balanced by the decline of its heroic virtues." About 200 years later, Tytler was “helped” to express these views a little more “modernly” in the 1970’s by people taking other quotes from 20-30 years before and forming a summary quote and a diagram of a cycle. The diagram below is commonly known as the "Tytler Cycle" or the "Fatal Sequence." The first known, and apparently original, publication was in a 1943 speech "Industrial Management in a Republic” by H. W. Prentis, president of the Armstrong Cork Company and former president of the National Association of Manufacturers. Since 2000, the cycle diagram and the editorialized Tytler “quotes” have been posted and emailed in criticism of the person who happened to be President at that particular time. 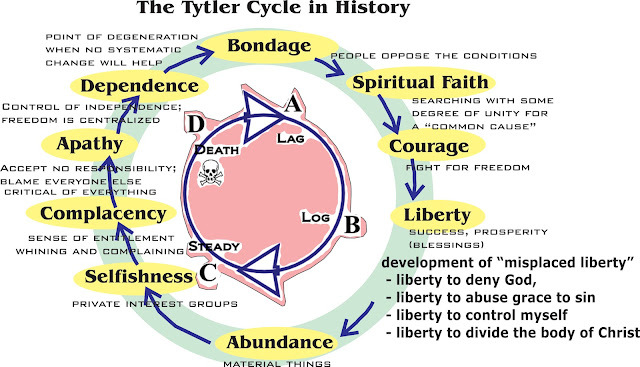 Although the cycle diagram and the quotes do not seem to be of genuine verbatim Tytler authorship, the more recent creations do capture the gist of Tytler’s view of the eventual fate of a democracy being related to the moral failings of a human society. Humans begin to impose their basic competitive, selfish, and greedy nature on the structure of the government, and they devise methods of control and corruption to get their way and to get an advantage of power over others. Tytler’s reference to the “law of nature” that a nation’s opulence and prosperity is inversely related to its moral and ethical structure is a description identical with what we are calling social, political, or ethical entropy. That which is isolated (left to itself) will degenerate and decay. If Tytler’s statement that "It is a law of nature to which no experience has ever furnished an exception” applies to social entropy, then an eventual corruption and decay within society is inevitable, if the society is left to itself without any spiritual or moral power source outside the isolated system. Things left to themselves naturally run down. The purpose of showing Tytler’s cycle is not to discuss the politics of a democracy. 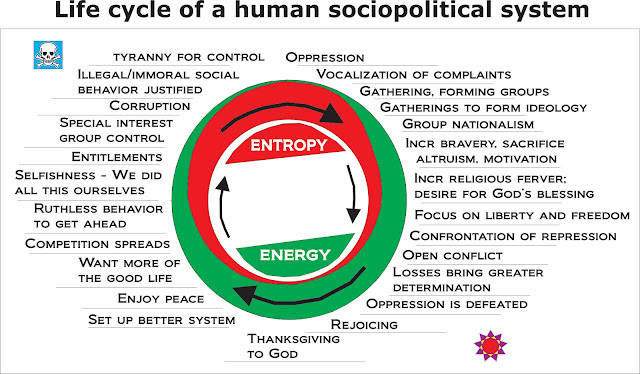 There are several points that can be made from the cycles representing changes in society – (1) relationship between cycle characteristics and an energy/entropy cycle, (2) comparison of the progression of behavior in the cycle with the works of the flesh and the works of the Spirit listed in scripture, and (3) comparison between the sociopolitical cycle and the life cycle of a bacterial colony. Effects of energy vs. entropy on a society. 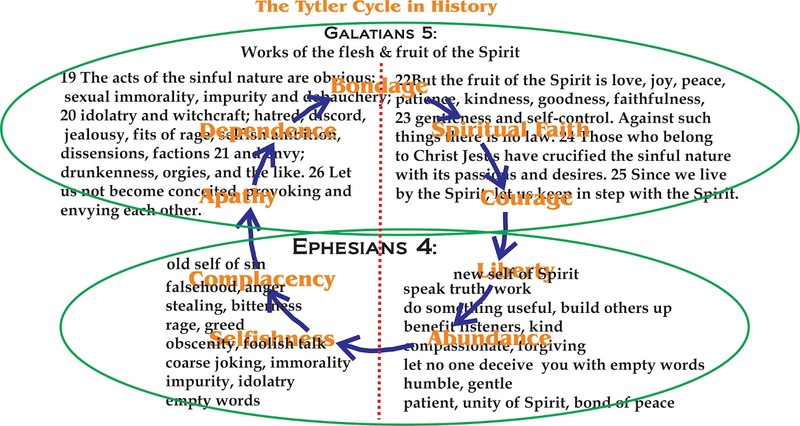 As a generalization, society behaviors that are on the right side of the cycle diagram resemble those described as “fruit of the Spirit” (Gal. 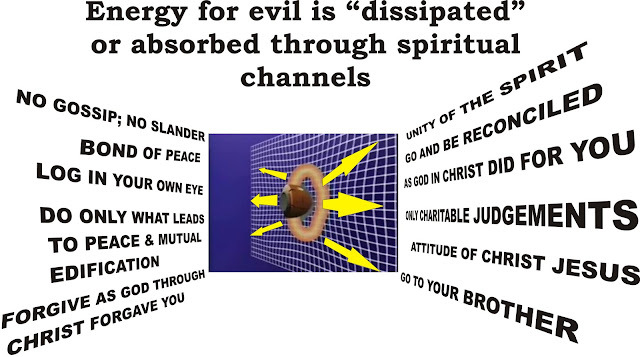 5) or characteristics of the “new self controlled by the Spirit” (Eph. 4). 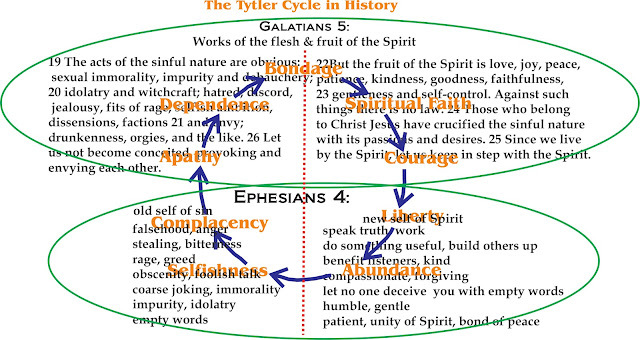 Those behaviors on the left side of the cycle resemble descriptions of the “works of the flesh” or the deeds of “the old man of sin.” Works of the flesh are associated with increasing social entropy, while fruit of the Spirit is associated with a supply of energy from outside the system. In addition, there are similarities between the progression of the Tytler (or a similar) cycle and the life cycle of a bacterial colony. Both situations have essentially the same cycle characteristics when operating in a system isolated from an outside energy source. To survive, the bacterial colony needs the intervention of an outside source of superior intelligence and supernatural energy; and the colony of human society needs the same. Otherwise they both develop into the death phase of accumulation of entropy – one is chemical entropy and the other more of a social or spiritual entropy. But the need for an outside energy source is one of the parallels from the laws operating in physical realm and the spiritual realm. God has revealed how He operates in both realms, but it takes both physical and spiritual discernment to see the relationship. 1 Cor, 2:12 We have not received the spirit of the world but the Spirit who is from God, that we may understand what God has freely given us. 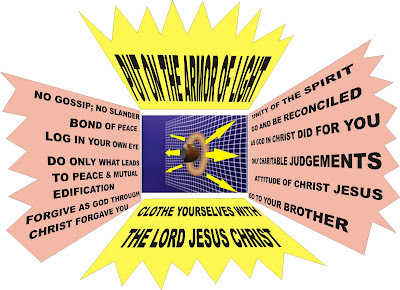 13 This is what we speak, not in words taught us by human wisdom but in words taught by the Spirit, expressing spiritual truths in spiritual words. 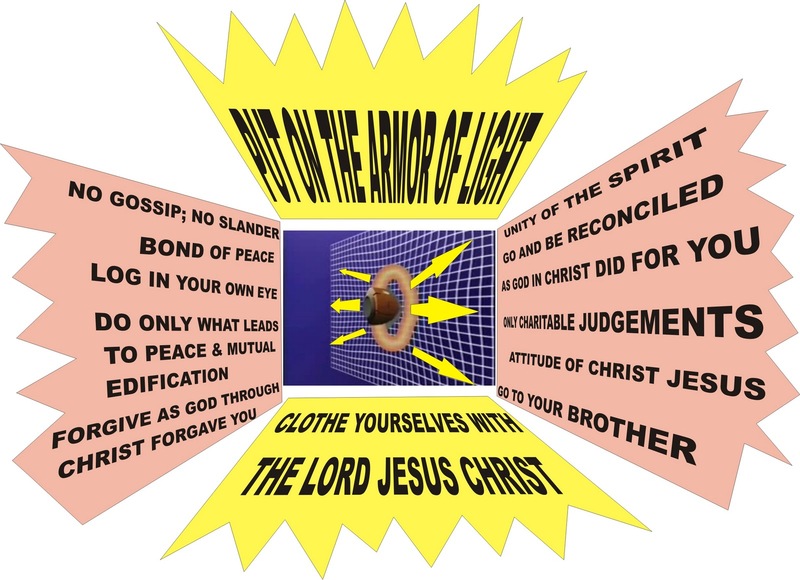 14 The man without the Spirit does not accept the things that come from the Spirit of God, for they are foolishness to him, and he cannot understand them, because they are spiritually discerned. What about a society that became so successful and resource-rich that it began to credit itself for the accomplishments rather than an “outside source of energy” -- God? What if this “great society” even began to redefine the past to make history in education more consistent with present human self-glorification? What if this society began to reinterpret not only history, but also the law, so that the separation of church and state should become not a protection of religion but a separation and isolation of religion as a clearer target for discrimination? What, if through political, academic, and legal means, the role or meaning of God were removed from public places -- such as in courthouses, parks, and schools -- and this action was favorably portrayed by the media as smart and good? If the outside source of energy for society is removed, what is left to take over? Entropy. The snowball gets larger as society continues to do it to itself. Some observations from the above verses – God’s wisdom and ways are not the same as what humans considered wisdom in their own eyes. Power is represented in the cross of Christ, which is nonsense to those whose understanding is limited by physical thermodynamic laws. These people have chosen to not avail themselves of the power of God that transcends the laws of the physical universe. They ridicule it. Yet, because of their chosen isolation, they are perishing. But they are not aware of it, because they are too “wise.” “Perishing” is in the present tense, not future, as in eternal judgment. Why do natural things “perish” in a system of thermodynamic isolation? They are subject to the destiny of natural entropy. The cycle of human effort, wisdom, and entropy will continue to play out over and over, just as in the past. One might ask, “If we have the sun as an outside energy source for the earth, then we are not thermodynamically isolated. 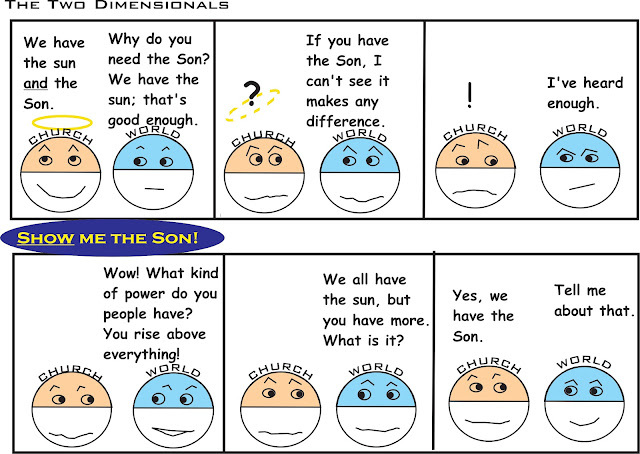 We have the sun; why do we need the Son? In the following passages Jesus differentiates between those things that are of this earth, and subject to entropy, and those things which are outside of the physical reaches of natural law. Matt 4:4 Jesus answered, “It is written: ‘Man does not live on bread alone, but on every word that comes from the mouth of God. Deut. 8:3 …man does not live on bread alone but on every word that comes from the mouth of God. Matt. 6:19 Do not store up for yourselves treasures on earth, where moth and rust destroy, and where thieves break in and steal. 20 But store up for yourselves treasures in heaven, where moth and rust do not destroy, and where thieves do not break in and steal. 21 For where your treasure is, there your heart will be also. Instead of changing from preaching to the world in an unloving way to a more Christ-like approach, the church responds to charges of being judgmental by slowly adopting what the world does. That’s not the reason to leave behind a condemning attitude – the reason is that Jesus didn’t condemn (John 8:11, 15; 12:47), and not because the church negotiates the scripture and takes on the world’s behavioral standard. Has this increased the respect of the world for the church? How many has this approach brought into a saving relationship with the Lord Jesus Christ? Postmodern humanism has been seeping into the church. Now much of the institutionalized church is opening the door and inviting the human value system to come in so it can be made the standard operating procedure instead of the scripture. What was considered bad behavior becomes more acceptable. More people do it; it becomes the norm. This is like replacing the power of the Holy Spirit with natural entropy. Irresponsible use of freedom. Freedom is based on responsible behavior in the use of the freedom. A small fraction of those with bad behavior take advantage of the freedom of everyone else by their selfish immorality. This corruption gets laws passed that place restrictions on the freedom of the entire group (think airport security), or sometimes the freedom may be cancelled altogether. The old law pointed out sin, and that made everyone want to sin or see how close they could get to it. More laws define the limit of behavior, so people push to see what they can get away with, whether it is the athlete trying to get an illegal move past a referee, a person buying booze and cigarettes with food stamps, or a misrepresentation of a product to get more sales. More bad behavior gives more laws which give more bad behavior of a higher sophistication and technology (think identity theft). This is moral entropy. As bad behavior continues, its effects accumulate. It is not self-correcting. The effects of bad behavior in a society build up like DDT in the liver. Prov. 14:34 Righteousness exalts a nation, but sin is a disgrace to any people. There are few ways that a church can better develop the attributes of Jesus Christ than by forming and maintaining a culture of peace. A culture of peace is when forgiveness and reconciliation become so much of the fabric of a church that conflicts are resolved before they spread into chaos, disorder, and division. The “reinforced behavior” of the church is peacemaking, the harvest of which is righteousness, rather than unforgiveness, indignation, and anger, the product of which is sin and destruction. However, using the scriptural definitions discussed in previous posts, this pistol would have been called, “The Peacekeeper,” not “The Peacemaker.” Making the peace of Christ, it did not. Moving now from guns to bulletproof vests. A little over a year ago (~2010), a story was published in the Daily Oklahoman about a Pottawatomie County sheriff's deputy who was shot four times in the chest at point blank range during a routine traffic stop and who was saved from serious injury by wearing a bulletproof vest. Wearing a bulletproof vest is a preventative measure that must be taken ahead of time. Putting on a bulletproof vest after one has been shot doesn’t help much. The year before, two of the deputy’s partners, who had been shot and killed, were not wearing protective vests. So it is with the protection of the culture of peace. With this culture in place, peace, a fruit of the Spirit, has been developed before an assault takes place. Peacemaking is often used for damage control, and it is certainly of value anytime it is used. 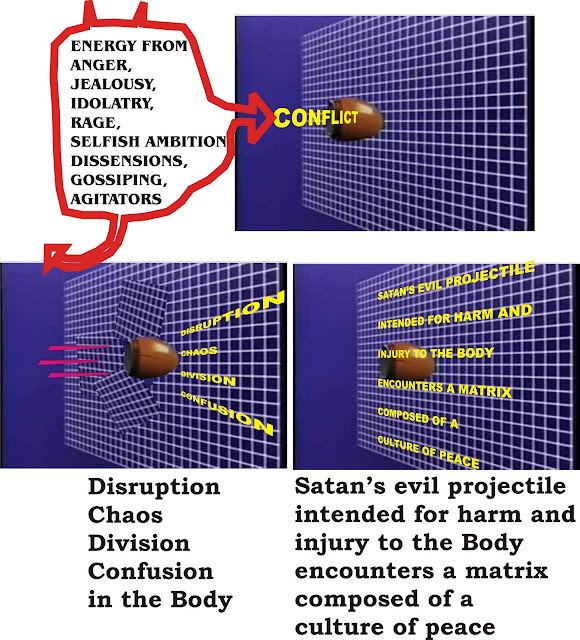 But if damage can be prevented or minimized from the start, then the enemy will not be able to use his tools of disruption, chaos, division, and hate as effectively. In this way peace is the bond for unity (Eph. 4:3). Peacemaking keeps unity intact when enemy assaults attempt to generate division. 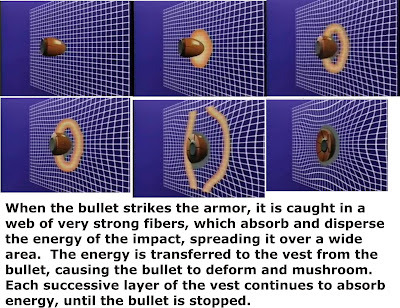 The diagram depicts how a bulletproof vest, such as the one worn by the deputy, works to protect the body from a projectile attack. 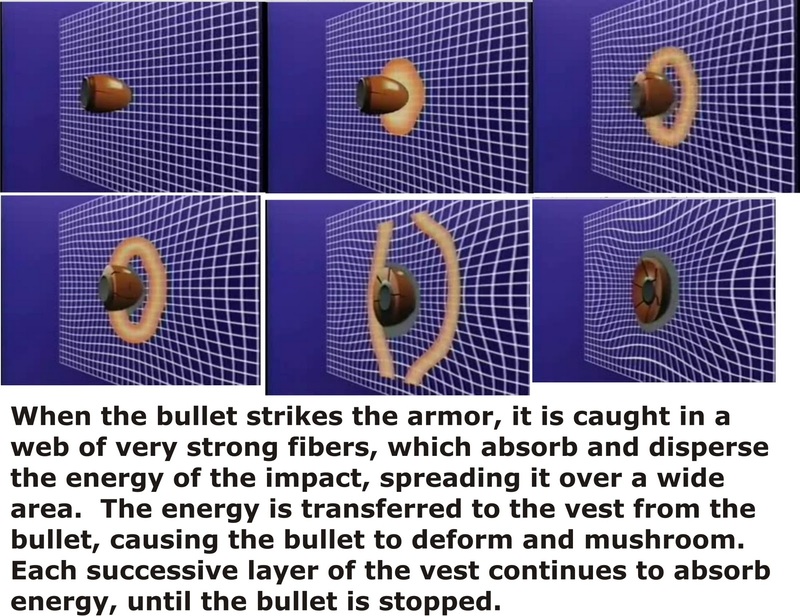 The energy from the bullet is projected laterally by the composition of fibers within the vest so that the force is absorbed by the material instead of penetrating through it. Satan, the adversary of the church and the accuser of the brethren, issues a projectile fueled by works of the flesh toward the body. 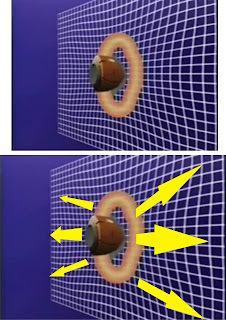 If the projectile penetrates the armor of the body, it will produce damage to the body and, perhaps, even be fatal. 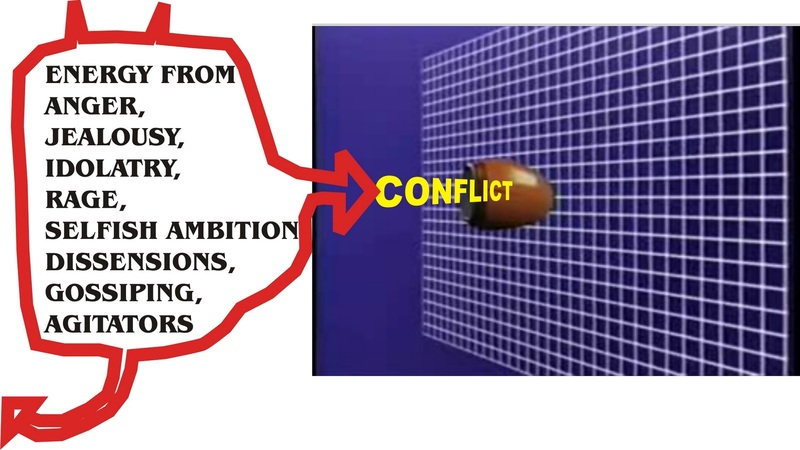 The projectile is conflict and its damage will be chaos and division. But the projectile of Satan hits a culture of peace that blocks penetration into the body. The culture of peace is an established way of thinking in which people, when offended or hurt by something or someone else, first think of the love of God for them and for the other members of the body before thinking of a damaging reaction out of the flesh. Peace and unity in the church are too important to be sacrificed on the altar of idolatrous selfishness, pride, and greed. These peace generating channels are already in place. Rather than defaulting to the behavior of the nature of Adam, people default to the behavior of the nature of Christ. The role of peacemaking and maintaining a culture of peace is consistent with many other passages that deal with Christian behavior. In a spiritual analogy to the bulletproof vest story, a “headline” was created to describe an opportunity during the last several years the Quail church has had to learn a lot more about the importance of peacemaking. The actual “headline” is only representative, but the lessons are very real. God used Peacemaker Ministries in a significant way. Peacemaking can be very helpful in resolving conflicts even when used like calling the fire department to put out a big fire. But a culture of peace is more like having fire retardant in place so that the fire doesn’t spread in the first place and can be easily extinguished. Where’s Smokey the Bear when you need him? Oftentimes, there will be roots of bitterness from previous conflicts (products of peacekeeping?) buried just beneath the surface, waiting to be inflamed again. Then, combustible materials are spread around over the surface, just daring a spark of conflict to occur. Teaching about love, peace, and unity is preventive action. Practicing these is growing to be like God.